The CHAINMAIL section reviews bands that were proactive enough to contact me directly. Here at Cerebral Metalhead, initiative is rewarded. Good southern sludge from western Nevada seems about as likely as a new Michael Jackson/Edward Kennedy duet album, but goldarnit, I can't deny the soul evinced by Reno's Dirt Communion. The band's bluesy sludge touchstones -- Corrosion of Conformity, Down, Kyuss -- are pretty obvious. So is their talent. This stuff requires a tightrope walk down the line between behind-the-beat sloppiness and deep-pocket groove, and Dirt Communion get it right. They specialize in dirty rhythmic swagger -- songs like "A Trip to the Slaughterhouse," "Bombed (Last Call)" and "Rebuilt for Speed" swing titanium ballsack riffs low and slow, with a ragged guitar solo 3/4 of the way through the latter that twirls frantically and dissolves into distortion. Dirt Communion write better boogies than songs, and singer Mark Earnest (discovered while singing "Fairies Wear Boots" in a Reno cover band, natch) occasionally lives up to his last name too well, considering the nastiness of the music. Didn't you heed pappy Anselmo's lessons about the benefits of cigarettes and thick coatings of phlegm? But ya know, if I ran into Dirt Communion playing in a bar somewhere, I'd stick around to listen to their whole set. That's more than I can say for a lot of signed metal bands that I'd pay to see. I like my sludge metal like I like my women: with a fat bottom end. Hey-o!!! "A Trip to the Slaughterhouse"
YEAH! Dirt communion kick serious asssssss! PUT SOME DOOM IN YOUR WOUNDS! 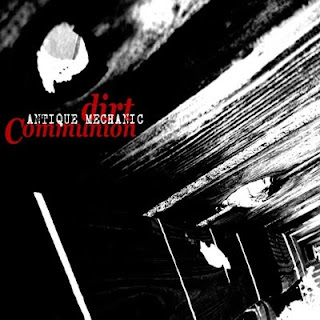 "Antique Mechanic" is now available on iTunes, Rhapsody, Napster, Amazon and most other major digital distributors! Look for a full length CD release in January!